LOS ANGELES, March 26, 2018 /PRNewswire/ — With more than 30 million albums sold, 18 million digital single sales, billions of streams and 12 iconic hits combined, 3 Doors Down and Collective Soul are inviting fans aboard The Rock & Roll Express Tour this summer with special guest Soul Asylum on select dates. Produced by Live Nation, the amphitheater outing will kick off July 6 in Atlanta, GA and travel to 36 cities across North America before wrapping September 16 in Phoenix, AZ. Citi® is the official pre-sale credit card of The Rock & Roll Express Tour. As such, Citi® cardmembers will have access to purchase pre-sale tickets beginning Tuesday, March 27th at 10amlocal time until Thursday, March 29th at 10pm local time through Citi’s Private Pass® program. For complete pre-sale details, visit www.citiprivatepass.com. Tickets go on sale to the general public starting Friday, March 30 at 10am local time. 3 Doors Down and Collective Soul will be offering their own VIP packages, which include band meet and greets, exclusive merch, and much more. All VIP packages will be available starting Tuesday, March 27th at 10am local time. 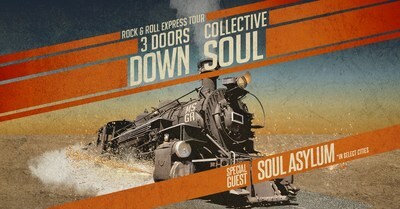 More information can be found at www.3doorsdown.comand www.collectivesoul.com. Collective Soul will also perform at 3 Doors Down’s 15th Annual “The Better Life Foundation Concert” this fall. The event will take place at Harrah’s Cherokee Casino Resort in Cherokee, NC for the third year in a row on October 27th. To date, The Better Life Foundation has donated over $3 Million dollars to veterans, children, women’s and humanitarian relief efforts domestically and around the globe.